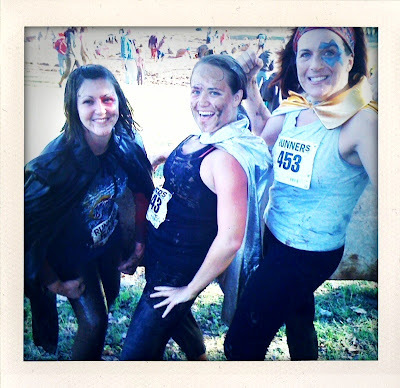 this weekend i participated in (among other things) a MUD RUN! 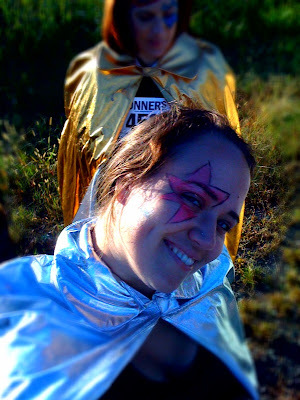 It is an annual 5K in Little Rock - costumes required. we didn't have a lot of prep on the costumes so we decided upon superheros with kiss style makeup. the race is basically a three mile run and and then you go through a little balloon arch (yea! balloon arch! always a sign the RACE IS OVER! woo hoo!) and then the last tenth of a mile is an ENORMOUS mud pit. the weather was perfect but that mud was FA-reeeeeezing. we took our shoes off to hop in and our toes were numb within the first hundred yards. there were mud puddles up to about my mid-thigh/waist. the three of us pictured above (keely on the left, waynette on the right in the last image) held on to eachother and flung mud everywhere. keely and i eventually opted to crawl - which was REAL fun and much easier. i kind of felt like a stripper (an awesome stripper who keeps her clothes on) i'm not going to lie. i also felt real badass running with a cape on. i think it made me FASTER! the only downside of climbing out of the mudpit was having to get nakey beside our car to put on dry clothes. nater got a kick out of all the muddy runners... he looked so confused! kinda wishing they did this in the summer. mud pit participation would be even more fun, yes? AHAHA! I LOVE that you ran with a cape!! One of the most fun activities I ever participated in was mud volleyball. It was in the summer and they had curtained off areas to hose off and change. Looked like you had a great time. haha, that's awesome! Tulsa has a similar run and I may just have to try it next year! Glad the mexican food aversion will pass- I love chips and salsa way too much to never eat it again! I'm convinced that if I wore a cape every where I would do things with so much enthusiasm and fanfare that my house would be sparking clean. 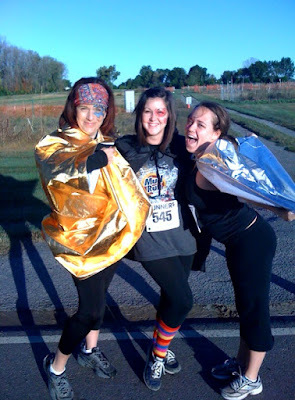 I'm gonna wear a cape this weekend for our run.